Here is my new booster - MXR GT-OD (a.k.a M193). it was inducted into the MXR product line and was renamed the "M193" during year 2010. The new M193 and the CSP021 are the same pedal. Only change being made to the box and removing the "Custom Shop" script. There's an internal slide switch which located on PCB of current MXR GT-OD pedal. You could move it to the opposite side from where it is at now for getting the MXR ZW-44 pedal sound. MXR will probably end up removing this feature in the future. Grab your GT-OD pedal as soon as you can. My another favourite booster - Maxon OD808. GT-OD is brighter, much aggressive than OD808 which is warmer and mellow. 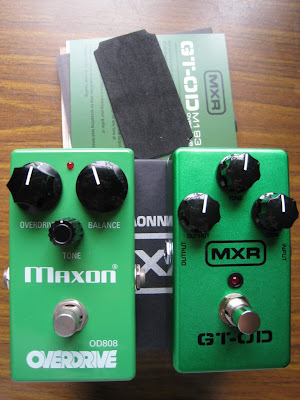 but Maxon OD808 tighten up the bass just slighly better than MXR GT-OD. If you're extreme metal player, I bet you'll like MXR GT-OD as a booster. Hi there,I really like your blog! I have some of the stuff you have as well, the Mark V, Powerball II, and since a few weeks the Herbert. I'm looking for a cab for the Herbert and have the same problem as you, no dealer nearby (I'm in Shanghai). I currently have an Engl 212 Pro (works for the Powerball but not so much I thought with the Herbert) and a Mesa Recto 212 (a bit boomy with the Herbert). How does the Herbert sound with your Mesa 412? Would you recommend it? I could also go for a Bogner 212 OS, ever tried one? Let me know! Thank you. My Herbert sounds great with my Mesa/Boogie Stiletto cab which blended with V30/G12K-100 speakers. G12K-100 speakers handle bass response pretty well. You may want to try a smaller-size cabinet with the speakers combination that I mentioned. My GT-OD CSP-021 model does not contain the Zakk Wylde switch.